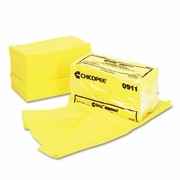 Home > Janitorial, Household Cleaning Supplies, Foodservice Products > Furniture Polishes , Wood Cleaners, Dusting Cloths, and Equipment > Chicopee Masslinn Dust Cloths 24"x24" 50cloths pkg/2 per case. Feature dust-catching fibers. Mineral oil-treated for increased dust pickup and enhanced finish with no lint or residue. Microban® antimicrobial protection inhibits bacteria growth. UL tested.